Health benefits of leeks and leek soup include its uses in nutritional deficiencies, epilepsy, constipation, anemia, pre-menstrual syndrome, heart diseases, etc. Leeks are one of the healthy vegetable. It shares same genus Allium with garlic and onion. Leeks belong to the Amaryllidaceous family. Leeks are cultivars of Alliums Ampeloprasum. The edible portion of the plant is the bundle of leaf sheaths. Some people name these leaf sheaths as a stalk or stem erroneously. They are tasty, versatile and easy to cook and prepare. They are having the milder flavor and larger in size, but still they are working quite well for the health benefit when added to anything like salads and soups. Wherever they are added, they do provide the benefit of fiber and bulk along with minerals, antioxidant polyphenols and vitamins. The flavonoid Kaempferol is available in the leeks. It provides protection for the linings in the blood vessels, which is particularly against some free radicals or the active oxygen species. It could also increase the production of the nitric oxide in individual’s body, it is a substance which acts as the natural dilator and helps in relaxation of the blood vessels due to which it allows blood vessels dilation, so leeks become beneficial for lowering the hypertension (high blood pressure). Studies have revealed that members of the Allium family have anti-hypertensive effects as well as heart protective effects. It prevents heart attacks by lowering the deposition of plaque in the blood vessels. It lowers the cholesterol levels and protects blood vessels from arteriosclerosis, heart failure and stroke. Leeks are also helpful to eliminate homocysteine molecules, which are responsible for detrimental effects on heart and cardiovascular system. Leeks are good source of folic acid and iron. Folic acid is essential for DNA synthesis, formation of red and white blood cells and cell repair. Iron is necessary for hemoglobin formation and oxygen transport. Thus, leeks are beneficial for curing anemia and increase hemoglobin level in the blood. Leeks are low in calories. Like 100 g of fresh stalks would be containing 61 calories. Further, the elongated stalks are providing ample amount of insoluble and soluble fiber. Leeks are one of the super foods beneficial in losing weight. Leeks have low calorific value, but they are very rich in fiber content. The remarkable fiber content is beneficial in keeping one satiated for the long and does boost the metabolism. Leeks can also fight the chronic inflammatory situations like diabetes, rheumatoid, obesities, arthritis with the virtue of its Kaempferol and polyphenols content. They are containing a bioactive folate form which is mentioned as 5-methytetrahydrofolate. The consumption of folate during pregnancy is regarded as one of the key to prevent any defects on the child during birth. The polyphenols are found in leeks, also known for the stronger antioxidants, which are fighting against the free radicals. Free radicals are causing ageing and chronic diseases, so leeks should be in your regular diet to delay aging and prevent chronic diseases. 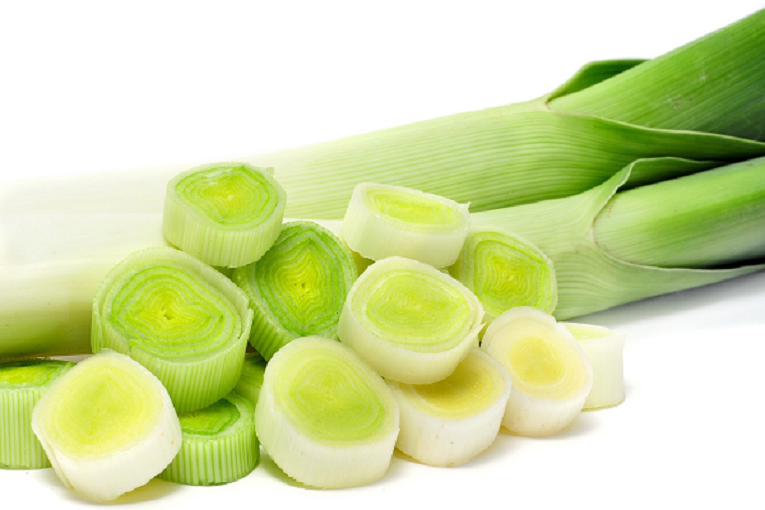 Leeks can also help in regulating intestinal function and the motility. Due to their fiber content, leeks also help in repopulating the right kind of bacteria in the colon. They are able to handle the reduction of the intestinal bloating and aiding the digestion. Moreover, leeks remove constipation and improve peristaltic movements of intestines. Leeks contain some volatile oils, which have the beneficial balsamic action with regards to the respiratory tract. Leeks can be used as the beneficial tools for relieving the symptoms related to the flu, hay fever and cold. Leeks also contain Vitamin C, K and E.
Leeks contain a good amount of Vitamin C, which is crucial and essential in healing of the wound and formation of collagen. Vitamin C helps to develop resistance against the infections and scavenges inflammation of the free radicals. Pyridoxine is essential and significant for the energy utilization. The Vitamin K, which is present in leeks, is required for the blood coagulation and connective tissue and metabolism of the bones. Iron is essential for the formation of the hemoglobin. Manganese is functioning as the co enzyme for many of the workings in the body. Leeks are good source of the Vitamin A (1667 IU or 55% of the RDA per 100 g). Vitamin A also helps in retaining the retina. Therefore, it corrects the eyesight and beneficial in color blindness. When you are eating it on regular basis then it is sure that you are gaining appropriate amount of nutrients. Some other flavonoid phenolic and anti-oxidants, like as that of the xanthin, carotenes and Lutein are also present in leeks. Leek soup provides a characteristic of cleaning, is helpful in purification of the body, and is eliminating the toxins from the body via the enhancement of the cleaning of the colon and intestines. You can use tender leaf sheaths for salad. You can also eat them raw. You can mix leek leaf sheaths with butter, cheese, other vegetables and seafood along with eggs. Leeks are also being used in noodles, pulao and fried rice, pizza, pasta and so on. Generally, leeks do not have any side effects. Leeks are having the positive impact on the human body. Until now, there has been no evidence regarding any damages or side effects caused to the human beings. If you are allergic to garlic, then you may also be allergic to leeks. Therefore, you also need to avoid leeks. Leeks are recommended in pregnancy as a vegetable and salad, but do not use leeks for medicinal purposes and avoid daily consumption. Leeks are usually cultivated in summer or autumn and should be planted quite carefully. Once leeks are planted, they grow in vigor. Leeks can be planted in any location with other plants. Leeks are not producing any kind of bulb shaped edible portion, whereas leeks are producing a different shape which is that of the cylindrical bunch of leafs with sheathes. Leeks are also beneficial in helping out in lots of diseases, which are dangerous and unremarkable. Leeks have many health benefits. You should wrap it up with paper towel so that it could be fresh for longer duration even though kept in refrigerator.